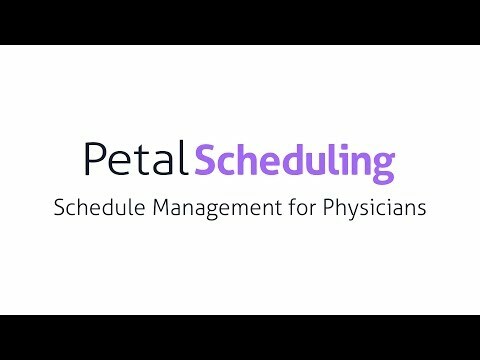 Petal Scheduling is a cloud-based schedule management software for physicians which supports four modules designed to simplify scheduling creation, distribution and management. Schedules are generated using automated technology which considers both physician absences and the rules of the medical service. Once created, schedules are kept up-to-date in real-time and are accessible anywhere, anytime, via PetalMD’s native iOS and Android mobile apps. The schedule digitization module allows users to plan group schedules while automatically considering team time management constraints such as absences and equity. Petal Scheduling gives users the flexibility to check their schedules on any desktop, laptop, tablet or mobile device, and ensures physicians stay up-to-date on new published schedules or schedule changes with automatic email notifications. Data synchronization functionality ensures that all information, including physician contact details, is updated instantly. Absence management and shift trade tools help to streamline schedule planning by allowing physicians to enter their absences, non-availabilities and vacations autonomously, as well as trade their shifts with specific individuals, or offer them to all physicians within the medical service. Petal Scheduling ensures users have control over requested changes at all times by allowing the planner to block tasks or set limitations for tasks, members and work teams. Online mental health EMR and practice management software. PetalMD is an intuitive scheduling platform that allows physicians to have a life outside of work. Docs can finally be there for their family, friends and themselves. Physicians who work at two sites or also have run a clinic outside the hospital no longer have to suffer hours by their computer and phone sorting through multiple trades when they are double-booked. Trades through a "marketplace" or directly between physicians are error-checked by the computer for schedule conflicts and updated to the master schedule in real-time. We no longer fax an updated copy of the schedule every few days to the hospital, not certain if the most recent version is the one posted; hospital clerical staff can have limited-access accounts to view the master schedule online. The technical support is always quick, helpful, and professional - the answer to my problem is always found. If your group is anything like my group, then they will have zero regrets going to this platform. I make the schedule for my department and I have found the scheduling system adaptive to our group's many unique needs. There is a learning curve to using the scheduling system and I would recommend training at least one other person other than the scheduler to avoid downtime if the scheduler is away unexpectedly. The training process was very helpful but becoming an expert in all the functionality of the schedule creation took me about 6-8 months to master (at least a couple of schedules). The scheduling system has to be meticulously programmed in its parameters or else it can do something really silly with people's schedules. Support has been great to adjust little rules to iron out these "bugs" in the rules I created with the PetalMD consultant. They always figure out a way to avoid similar problems in the future for me. We are now in our sixth iteration of the schedule and every round the schedule making gets easier. The mobile app does not have nearly as much functionality as the desktop website version. Some missing features can be very important like no error-checking for shift trades. Wow! Thank you for this amazing and complete review! We're really glad to see that you fully appreciate the time saved by our software; this is one of our goals! Better way to book off time. there are a number of different calendar views that make it easy to navigate. I can clearly see what I have booked off. I am able to see who is working with me during the day and who is available for trades. trades are straight forward. there are a number of different calendar views that make it easy to navigate. I can clearly see what I have booked off. I am able to see who is working with me during the day and who is available for trades. trades are straight forward. I book off months in advance and there are only a few options for time off, there should be more Sometimes, my days off are dropped. Printing can be hassle - I like a particular view which is sometimes hard to find in the list of options. The more users the more confusing the trade situation. I usually have this ironed out before hand and then go into Petal to make the switch. Otherwise it moght be a bit more difficult. Thank you for your kind words about the calendar views and trade features! Please know that we are currently working on upgrading these features to make them easier to use. As far as your comment on the time off functionality, the planner of a group can create the categories that s/he wants to allow the group to use. So you should check with your group planner. This is not a PetalMD limitation. I like the calendar format and ability to easily switch between specialty call schedules. I also like that I am able to use it on my phone as well as laptop. Inability with current package to let the software make the scheduling decisions. I understand that this due to the package that my department has purchased but it is an issue with my use of the software. The second issue I have is the ease of use for scheduling is not that user friendly. I have to try things a couple of times to figure out the right way to do things. That said customer service is excellent and has always helped me figure out any issues I may have. Thank you for your positive review of our customer service! PetalMd is easy to use. It displays the hospital call schedule in a clear way that is easy to navigate. The editing field in the "assigned physician" part of the scheduling section isn't formatted well. To add a comment or edit the time, you need to go to the dr list beside the schedule, go to the bottom and then scroll across to get to the wheel that allows you to open the edit page. It would be nice if it all displayed without having to scroll across. It would also be nice if the administrator could add the contact information for the physicians in their department so that the physician didn't have to log on and do it themselves. There is a lot of missing contact info as a result. Thank you for your review! It's important to us that your hospital on-call schedule is clear and easy to navigate. We have a brand new module to manage contact information within your hospital by administrative member, ask our sales team for more information. Our goal is to save you time, after all. Regarding your suggestion, we'll look into it. We have found in the past that screen size can be an issue. Have you looked into adjusting your screen resolution? Nonetheless, it's this kind of advice that helps us to improve our solutions, so again, thank you. Simplistic symbols he one learn how to use this software. It is helpful to also learn the mobile app is it is also useful on a daily basis. The software is easy for MD's to learn and manipulate to their own needs. It also helps with sorting out call equity issues. Need to spend to time become adept but this is overall a quick process. My biggest issue is I would like the mobile app to allow me as a scheduler to make changes. Currently this can only be done it seems from a desktop which can be limiting. We're glad to hear that our application helps you on a daily basis, that's what we're aiming for! For the moment, some features for scheduling are only available on the desktop version because scheduling comes with a lot of options; but we understand your concern and we will see what we can do regarding changes. Designed to reduce schedule planning time and address scheduling issues as they come up through the automated step-by-step process. Allows users to access their schedule in real time from any mobile device and keeps physicians informed with instant notifications. Enables users to get medical teams involved in shift swaps and transfers while staying in control with approbations. Users can synchronize their schedules with external calendars, including Google and Microsoft Outlook. Petal Scheduling is hosted on Microsoft Azure's cloud servers and complies with Canadian PIPEDA safety standards for maximum security and confidentiality. Below are some frequently asked questions for Petal Scheduling (PetalMD). Q. What type of pricing plans does Petal Scheduling (PetalMD) offer? Q. Who are the typical users of Petal Scheduling (PetalMD)? Q. What languages does Petal Scheduling (PetalMD) support? Q. Does Petal Scheduling (PetalMD) support mobile devices? Q. Does Petal Scheduling (PetalMD) offer an API? No, Petal Scheduling (PetalMD) does not have an API available. Q. What other apps does Petal Scheduling (PetalMD) integrate with? Q. What level of support does Petal Scheduling (PetalMD) offer?